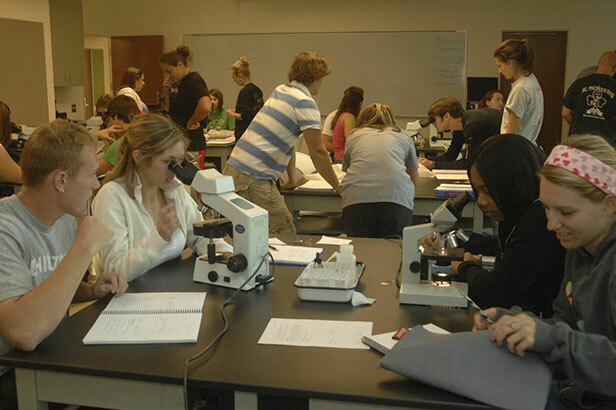 The Ohio State University Center for Life Sciences Education (CLSE) houses two blockbuster programs: the Biology Major and the Introductory Biology Program (IBP). Staff is dedicated to designing and delivering effective and comprehensive programming in undergraduate biology education. The CLSE successfully competed to participate in the Howard Hughes Medical Institute’s Science Education Alliance (SEA), joining 40 other institutions around the country in the first phase of an experimental program to change the way freshmen learn about science. A new laboratory is home to the yearlong course to study the genomics of bacterial viruses, or phages, in soil. Students isolate and characterize phages from their local soil; prepare the viral DNA for sequencing, and annotate and compare their sequenced genome. The first class has just 24 students. Graduate Teaching Associates (GTA) teach laboratory and recitation sections providing an unparalleled student-centered approach to learning. This model is a win-win for everyone; it empowers the undergraduate students I teach, provides phenomenal professional development opportunities for the graduate students teaching in the program, and further strengthens student-centered education. “Because we are the closest contact to the students, we are encouraged to receive direct feedback from them about problems they encounter in lectures, exams, experiments, etc. This allows us to constantly improve the course to suit their educational needs.” says GTA Thushani Radrigo-Peiris. Breitenberger, director of the CLSE, and her team are preparing Ohio State’s biology majors to take on a heavily competitive world—scientific and medical research, careers in medicine and other health care fields, academic scholarship, biotechnology, and other emerging fields. Students who major in other areas, like engineering and education, who want a deeper understanding of the biological sciences than they would get in the coursework incorporated into their major, pre-professional students who wish to major in a non-science area, business students pursuing careers in biotechnology or pharmaceuticals, students in journalism, etc. will benefit from the biology minor.